Adventure junkies would never think of Laos as a top of mind destination. Perhaps, they would think of bungee jumping in New Zealand or Australia, or even sky diving in Hawaii or even Cape Town. But a few years ago, I found myself in Pakse, Laos. Trust a travel writer to find herself in an off the beaten path location. I was there as a media delegate for the Mekong Tourism Forum. I was not prepared though for an exhilarating post conference adventure. One of the speakers in the conference was Inthy Deuansavanh, the man behind Tree Top Explorer. He owns several boutique hotels in Laos, including the Jungle Hotel. Located 20 meters above ground, the hotel is literally up on the trees. It requires a zip-line to leave your room for lunch or go to the bathroom. But my mission was not to spend the night in the Jungle Hotel. Along with 24 international visitors, my mission in the farming village of Ban Nongluang in Paksong, Laos was to experience Tree Top Explorer. 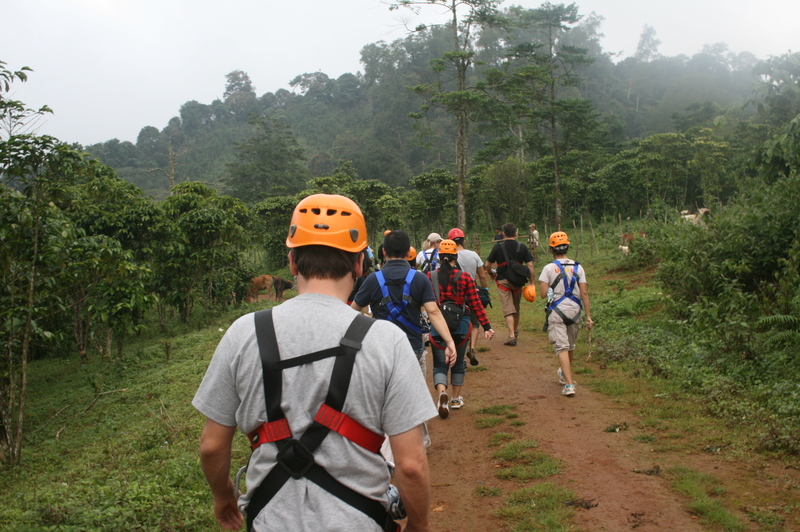 It meant conquering 8 ziplines, abseiling and canopy walks over the abundant Laos forest of Dong Hua Sao National Park. What was I thinking to saying yes to writing (The article appeared in Business Traveller Asia Pacific Magazine) this adventure? How could I forget one major detail, my fear of heights? But I joined all the other participants suited in our harness, helmet, and a small wooden twig they called the zip-line brake. Our first task was hiking for 5km to reach our first canopy walk. It meant negotiating up and down the streams, steep inclines and muddy terrain. My legs were already wobbly at this point, but I still had to conquer the wobbly hanging bridge. The reward was the beautiful view of the waterfalls. 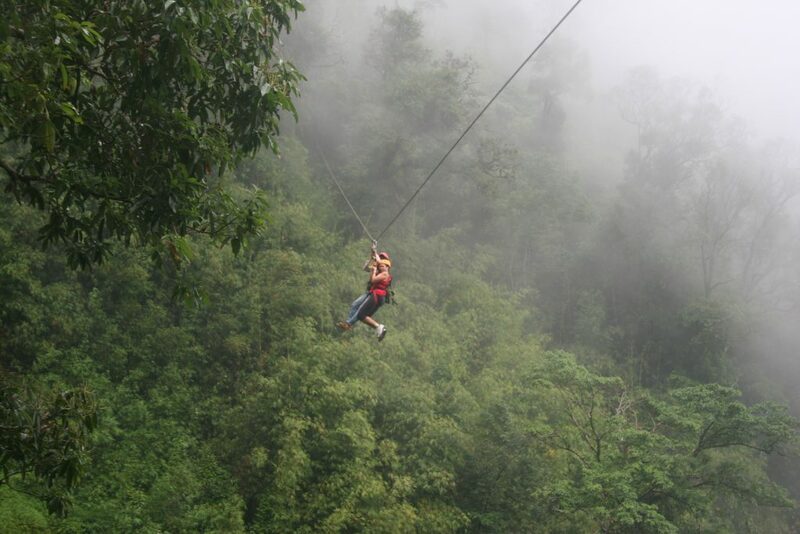 The first of the eight zip-lines was the longest zip-line at 450 meters. Tree Top Explorer has a total of 12 zip-lines but our day adventure could only allow eight. They assured me all I had to do was sit back, get off the ledge, and fly until the man at the end of the line would yell: “Brake! Brake!” Then, I would use my little stick to stop. I screamed like Tarzan, minus his confidence. My eyes were shut tight for first zip-line. Every zip-line I conquered, I was rewarded with a different aspect of the forest revealed to me. The most majestic was the breathtaking Khmuat waterfall. Apart from conquering the thrilling zip-lines, we were required to abseil down the trees with some towering five stories high. One male companion was afraid of heights too. He was cursing, hugged the tree, and refused to let go of the tree. Fear resides in your mind. My hyperactive imagination is a fertile soil for fear. I wondered, “What if you get stuck in the zipline? What if mid-way through the journey it stops?” I had to appease myself so I asked my companions. They assured me, “That would never happen!” But lo and behold, it happened to me on the highest zip-line. Midway through one of the zip-lines I dangled there. Thankfully, I did a tandem. Apparently, we braked too early. So one of the Tree Top explorer staff had to manually pull us until we reached the end point. Is it possible to get stuck on a Zip-line. The answer is YES! 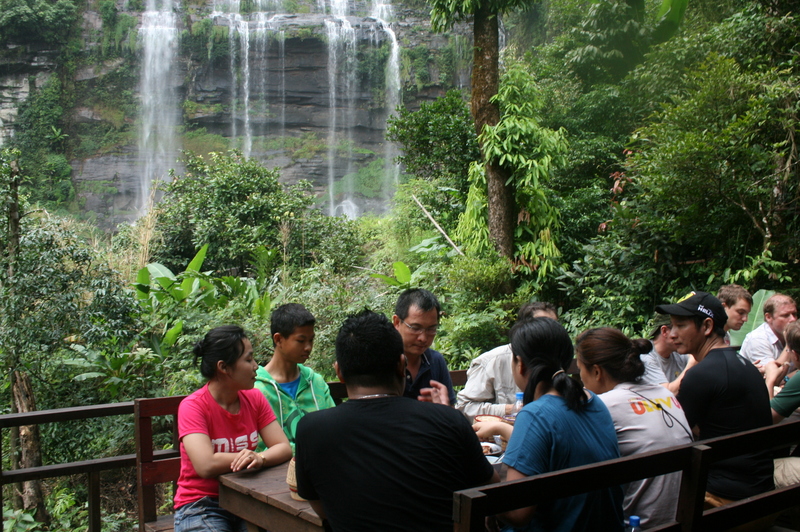 After all my screaming, feeding, and conquering my fears, we were treated to an alfresco lunch by one of the waterfalls. 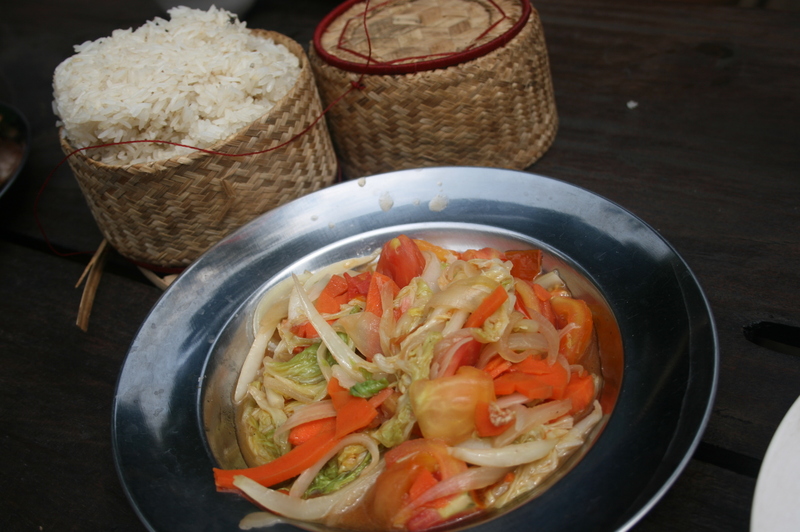 It was a spread of pumpkin soup, Khao Niew (sticky rice), Jeo (spicy tomato salsa) grilled pork, and sautéed vegetables. 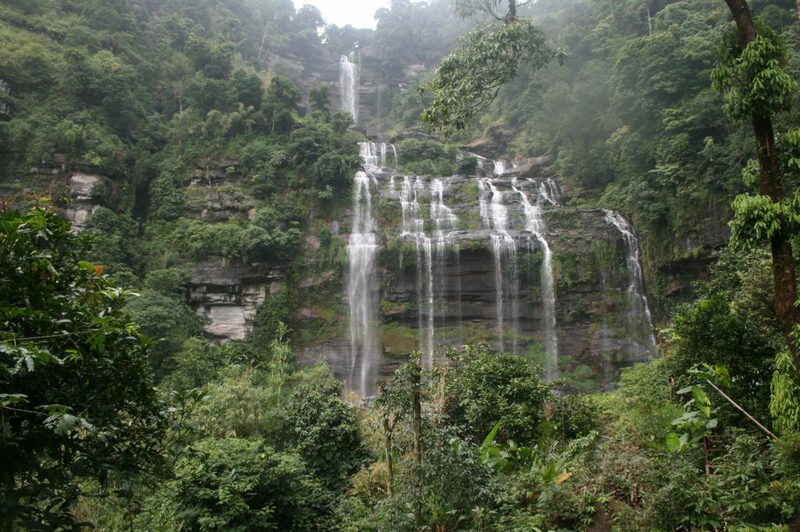 Tired, I sat and marveled at the waterfall, with water gushing 300 meters down. 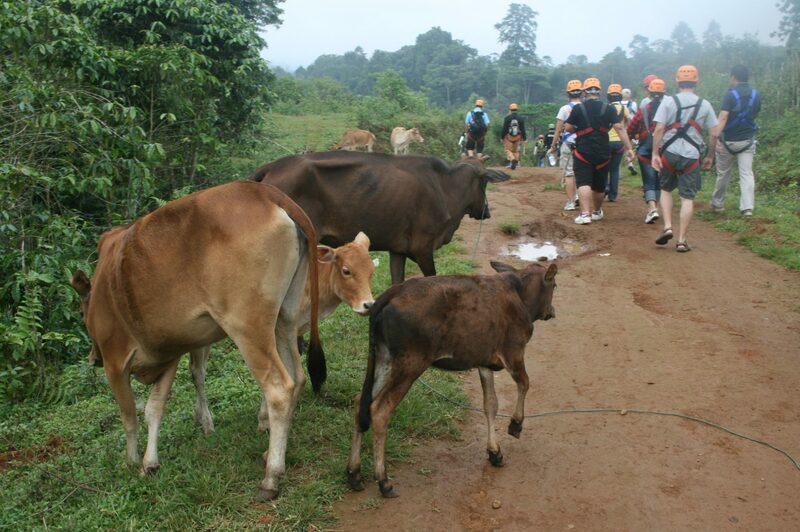 I had no idea the only way out of this jungle required negotiating a 300-meter trek upward. My last challenge was called a Via Ferrata. 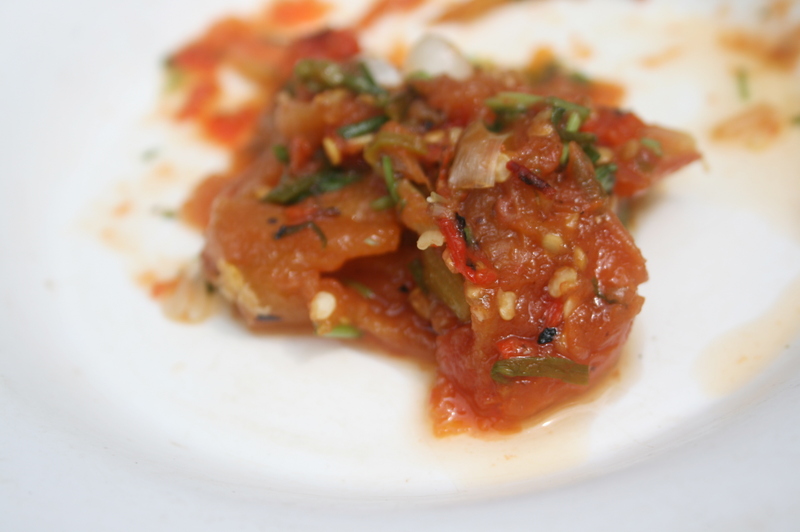 I loved this Jeo, spicy tomato salsa! My knowledge of the Italian language is limited to food: Tiramisu, Gnocchi, Cannoli, and Foccacia. I had no idea what Via Ferrata meant, iron road, or a protected climbing route in the alps. Before me was a rock-climbing wall above the waterfalls, ravines, and gorges. But they did not speak English and I spoke not a single word of Lao. But despite our language barrier, they could see my legs and arms trembling. The fear in my heart was visible. These two very patient men assisted me gingerly negotiate every single step, until I finally made it to the top. Pretty waterfalls turned out to be my final challenge! It has been five years since that trip to Laos. But here’s something I learned. Fear, whether real or imagined, is limiting. It is something that resides in your mind, but its power can paralyze your entire body. Fear can also shrink your life. Feeding your fear leads you to say No to life-giving opportunities. I have done many thrilling things in my life like jumping off a cliff and parasailing; soaring high on a motorized paraglider; and even hitchhiking. Now in my forties, I wonder if I really did all that. But there are photos and published clips of articles proving I really had those adventures. They are real. As author Anais Nin wisely said, “Life shrinks or expands in proportion to one’s courage.” We are all called to take a leap of faith. Go ahead. Take the plunge. You may be kicking and screaming as I did. Your zip-line may get stuck at some point during the course. But there will be angels along the way to help you stay the course. They may not speak the same language but they are there. I’m sure of that. I’m also certain that I have a very hardworking guardian angel who works overtime and needs a raise. So get out of your comfort zone. Live big. Face your fears head on. Take a deep breath. Then leap. It is time. Here we go! If you enjoyed this post, kindly do me a favor and share it on Facebook or Twitter or Instagram. Thanks! You are really amazing. To have such fear and yet to put yourself thru such thrilling advenrures. I sincerely doubt I would have such courage. Wonderful coverage of your journey. Felt I was there, though i did not experience the adrenaline surge. Thanks for reading the blog, Evelyn. I really appreciate it. I hope it inspires you to face your fears, too and feed your restless appetite. Hope you continue reading the blog and spread the word. Also if we can stay connected on Facebook and Instagram that would be great. Links above.